De-clutter and earn some extra income! 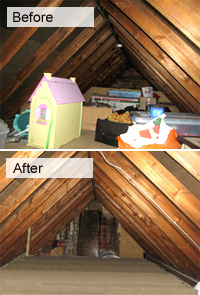 Have you got a loft full of junk that you no longer need to keep? Is it months since you got anything out of the boxes that you’ve kept in your garage? Do you have a ‘just in case you need it’ cupboard that has cobwebs across the door? Well, at Storenextdoor we are offering an incentive for you get round to de-cluttering – it could mean an extra £20 – £25 a week in income on an ongoing basis, and you could earn it even when you are asleep. What’s the catch Miss Mo? Well it might mean a bit of a clear out and a couple of trips to the charity shop (or down the skip if it really is a load of junk that you’ve been hoarding). But once you’ve moved your stuff all you would need to do is to spruce up your space so that it looks inviting to someone else who might actually pay you to put their stuff there instead of yours. But how do I know if people want my loft? I hear you say. Well – we know that there are people who need self-storage (we call them Squirrels) using our search at this very moment looking for spaces to rent. If you have a really large space you can actually list it more than once to give your local squirrels more option on price i.e. you could list a large loft as a whole space for £24 a week or you could list it in two halves at £12 a week each. This loft on the left belongs to Zoe from Bath who was one of our first people to list after having a big clearout of all the toys that her kids no longer use and spotting our ad in her local newsagent’s. Apparently she’s saving up for next year’s holiday in Spain so we’ll make sure she sends us some snaps from the beach! If you want to find out how much you might be able to earn from your space if you have a clear-out, you could have a go with our earnings estimator. If you put in the dimensions of your space it will give you an idea of how much Squirrels are willing to pay in your area for the size of space that you have. If you then decide to go ahead and make a listing there is a handy downloadable helpsheet to help you get started. And obviously I’m here if you need me so get in touch! The Storenextdoor Big Spring Clean – declutter and earn!